The key to any business’ success is to have reliable partners. 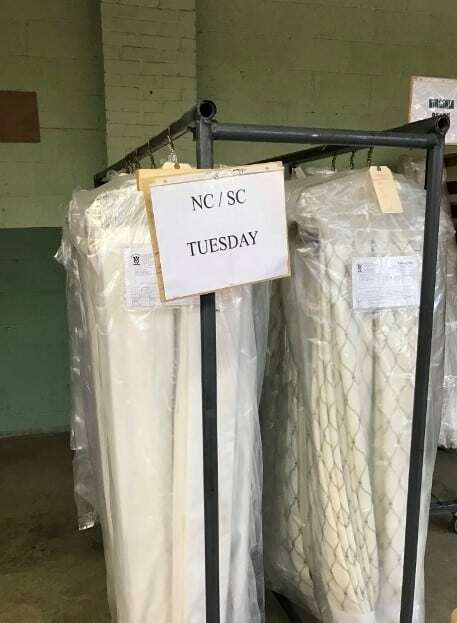 This is true as well for the products the interior design industry provides to their clients, including custom window treatments and custom bedding. I have been working with Virginia Quilting for a while and finally set a date on my calendar to visit the facilities. I wanted to learn about its processes, products, and meet everyone I am in contact with when working on your projects. So, if you are curious about how the workroom looks, come join me. Virginia Quilting is located in a small Virginia town of La Crosse. 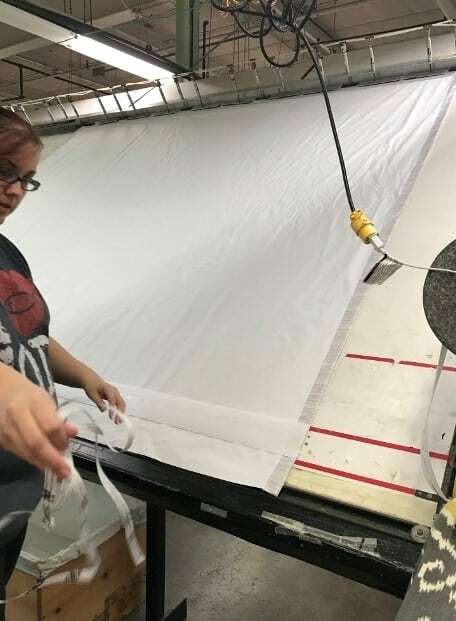 It employs about 200 people, most of them have 15-20 years of experience in custom window treatments and bedding fabrication. It has two divisions, residential and commercial. 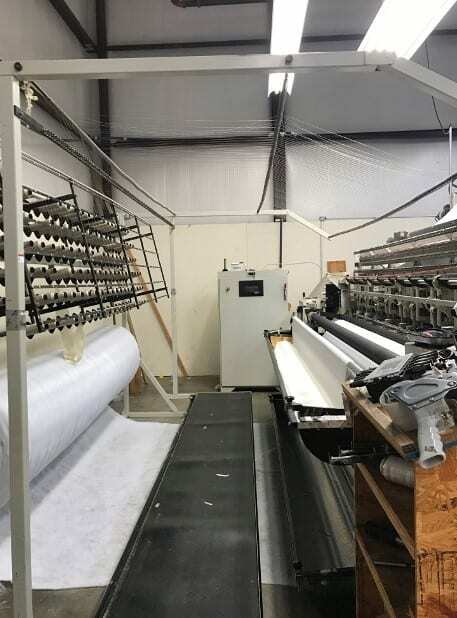 The commercial division fabricates window treatments for big hotel chains and casinos. Residential division is more custom oriented and is open to handle smaller, personal projects. Orders come from all over the country. 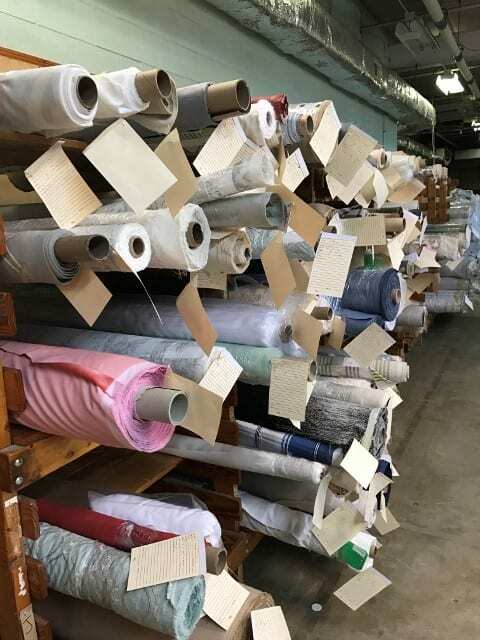 Here, the bolts of fabrics are waiting to be checked into production. 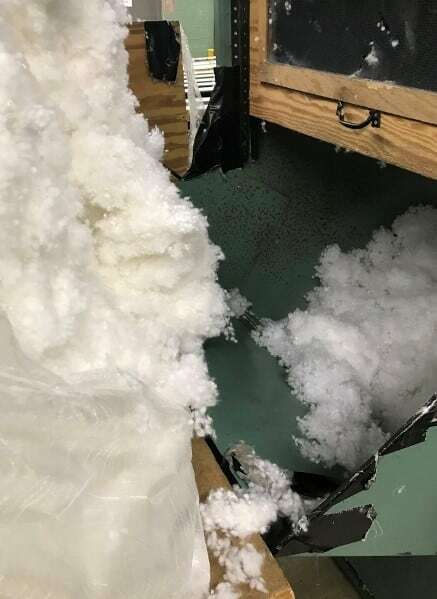 This is probably inside your throw pillows – down-like poly fill. If a project requires, custom pillow sizes can be made right here. The first section we visit is the quilting area. 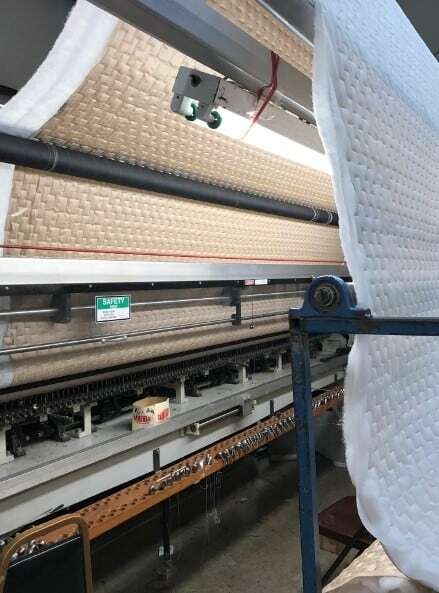 There are several machines to perform quilting on bedspreads, comforters, shams, etc. 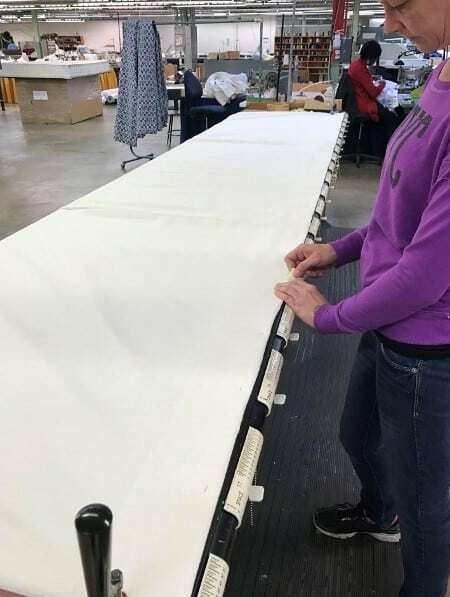 The workroom can make so many variations of quilting patterns and has different machines to handle the different styles. The most popular patterns are Clouds, Shells, Squares, and Channels. I can see this going in either design style direction, traditional look or contemporary. Not only do they quilt fabric but wallpaper as well! Imagine that – a quilted wallpaper! 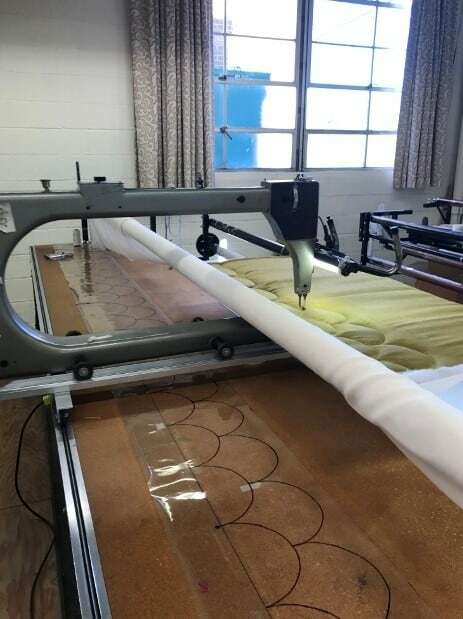 This machine moves over the quilting pattern drawn on a plastic sheet. 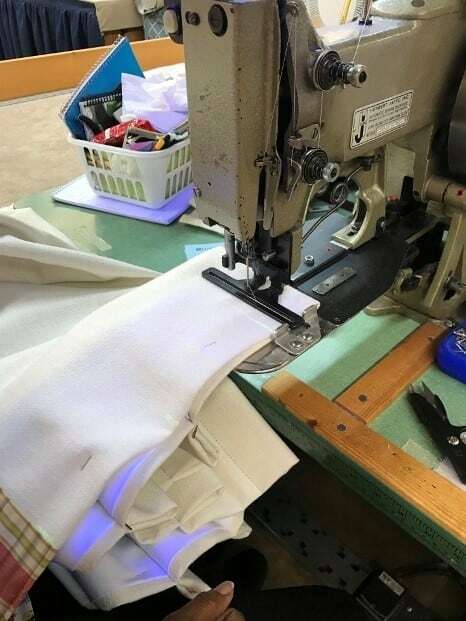 The laser beam follows the pattern on the surface and seamstress guides the sewing machine hand with the needle. It was mesmerizing to watch this one in action! 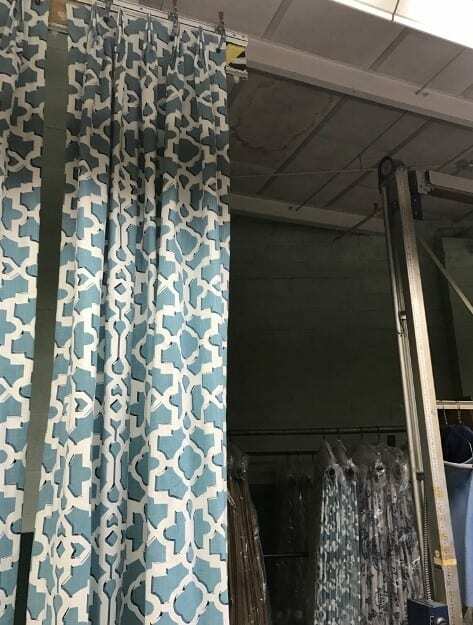 As we walk around the workroom and are headed to the drapery section, I ask Cindy Clevinger, the plant manager, do they see any changes in window fashion trends just by the orders they received. She says that there is always less of something. 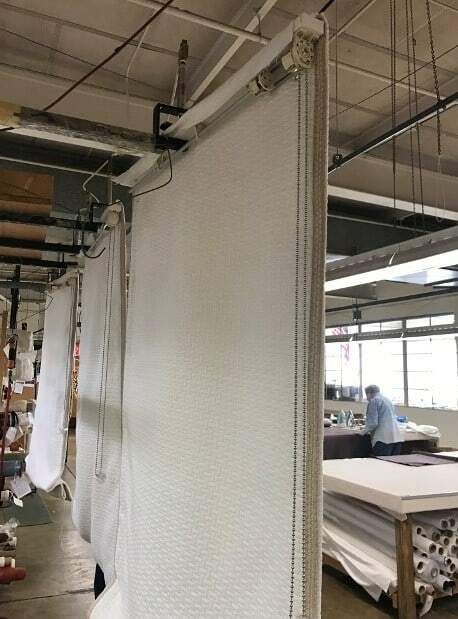 The workroom sees more panels orders now and less top treatments, and it will change some time down the road. The bestselling styles are French and Euro pleats. – How about colors, patterns, fabrics textures? – We see it all. And it is true. I am seeing all different colors around, it is not all gray and linen as one might expect these days. I also see a great variety of patterns: French Country, geometric, floral, stripes, abstract, lattice, and so many others. Which confirms one basic philosophy: one has to design for oneself, for who you are. Drapery panel hung upside down to apply the crinoline to its top. 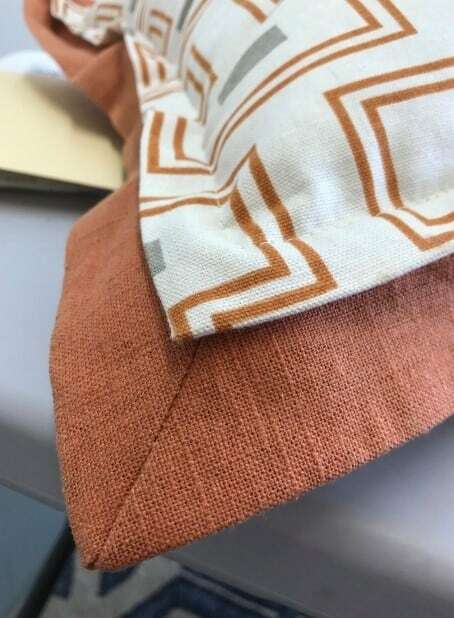 Custom drapery panel with custom banding made out of fabric and applied to the face fabric. The spacing for the pleats are being marked manually to assure proper pleat placement. No, you don’t want the seam right in the middle of the pleat. This sewing machine actually sews side to side! Finished custom window treatments are inspected. Yay, it is going to North Carolina! Carefully folded for the shipping. Inverted shades only missing a custom valance in the front. This top treatment fabric reminded me of Missoni pattern! It looks like a watercolor was folded on the table. This pattern is so pretty! I noticed some empty worktables as it is a slow season after the Holiday rush in December. I ask Cindy how may orders does the workroom have on an average day? 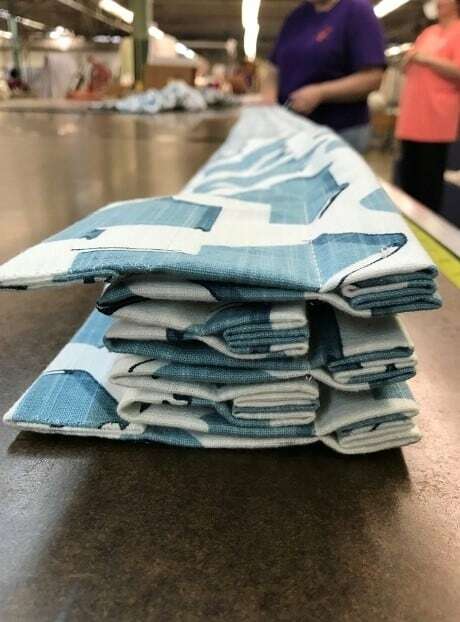 She says that in one week they make about 1000 bed skirts, 300-400 draperies panels, several hundred pillows, 30-40 board mounted treatments, among other things. I am impressed with the volume this workroom can handle. – So, the question I want to ask you, store bought curtains vs custom made? – Well, there are some out there that are well made and there are some that will not last as long. You will have a limited number of styles, and in case of rod pocket style, the pocket will be limited to the diameter of the hardware the store sells. This will limit the fabric choices. 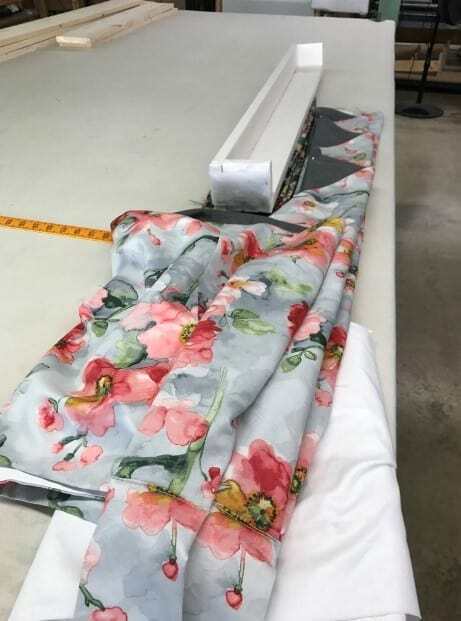 The sides of the panels most of the time will have single stich hem (- the stich you will see on the face of the drapery panel, – LK Design) and custom hems will be blind stitched. Quality of the lining will vary. She is right. 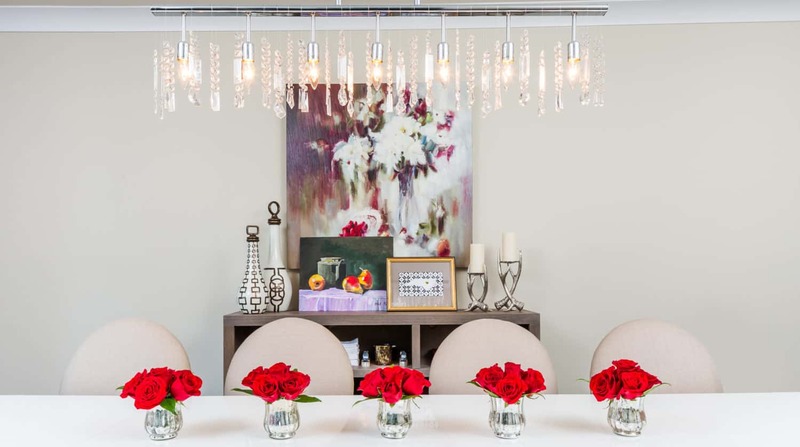 I also tell my clients that drapes should be specified to particular windows and room size. Proportions should be balanced and design elements should be chosen to enhance overall look and serve specific function: decorative, room darkening, heat control, etc. 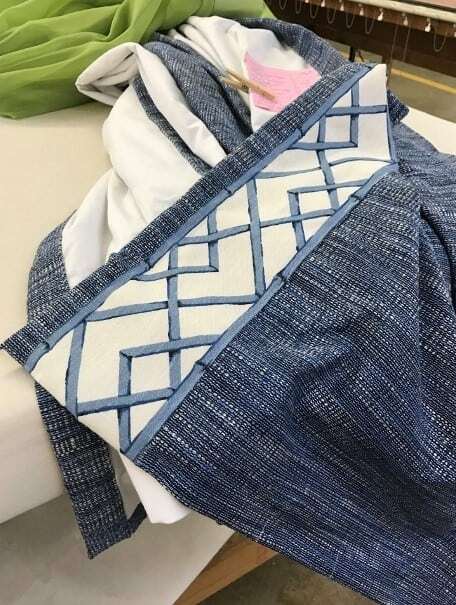 I have also learned that to transform the fabric to a custom drapery takes nine hands. Yes, if I bring you a pair of drapery panels, you know there were nine people who worked on it! While we sit in Cindy’s office I see this unusual pillow cover. Mitered corner, double flange pillow. – Yes, this one is a mitered corner, double flange pillow, – she says. There is always something new to learn! 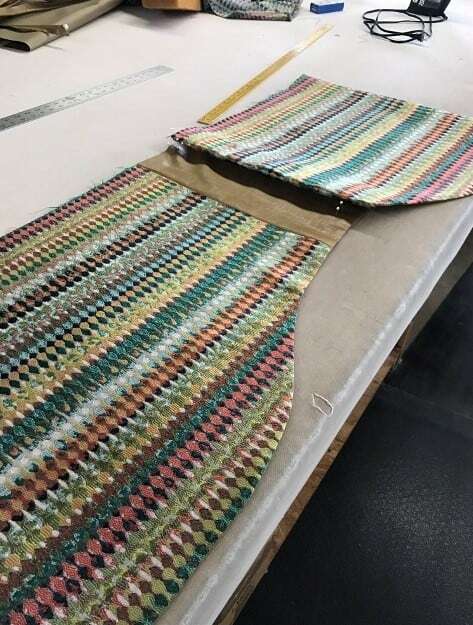 Cindy tells me that when they see new design features in window treatments, bedding or pillows popping up again and again in design magazines, they immediately try to figure out how to make it, because they know they will be getting orders for new designs soon and they want to be ready. As I am leaving the workroom today, I can’t wait to get to my studio in Durham, work on the design projects I have waiting for me and send them off to Cindy and her team. I know they will be in great hands! If you are looking for custom window treatments or bedding, and would like engage a design professional, pleases give us a call 919.389.6444 to talk about our services and schedule a design consultation. Also, check out our services page to learn about the 5 easy steps to your beautifully dressed windows.